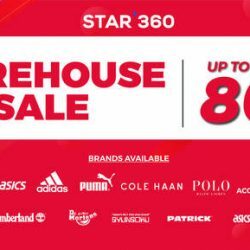 30 Aug - 2 Sep 2018 STAR 360: First Ever Biggest Lifestyle Branded Warehouse Sale with Up to 80% OFF Birkenstock, Cole Haan, Adidas, MBT, ASICS & More! STAR 360's first ever biggest lifestyle branded warehouse sale! Be sure to head down this weekend - 115 Eunos Ave 3, Zhaolim Building from 30 August till 2 September! Enjoy up to 80% discount on brands including Birkenstock, Cole Haan, Adidas, MBT, ASICS, PUMA, NIKE Accessories & more!